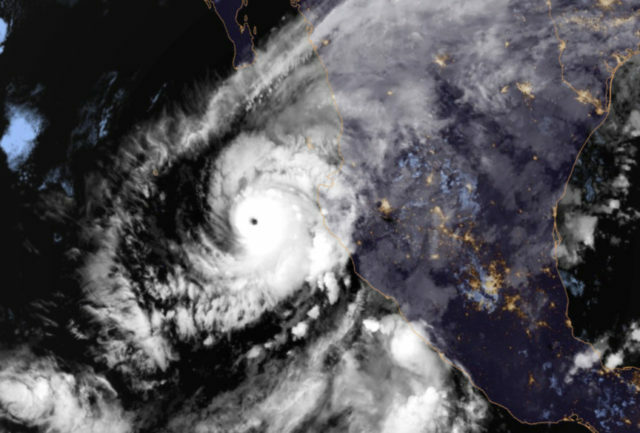 The National Hurricane Center says Hurricane Willa has grown into a potentially catastrophic Category 5 storm on a track toward the Mexican coast south of Mazatlan. Willa has maximum sustained winds of 160 mph, though it’s projected to weaken somewhat before hitting land late Tuesday. It is still likely to be an extremely dangerous hurricane when it hits. It’s located about 135 miles south-southwest of Cabo Corrientes and is heading north at 7 mph. The storm was projected to weaken somewhat before hitting land but was still expected to be extremely dangerous. The governments of Sinaloa and Nayarit states ordered coastal region schools to close and began preparing emergency shelters. Mazatlan, with a metropolitan-area population of about 500,000, is a popular vacation spot. It is closer to the U.S. than most other Pacific resorts and home to a large number of American and Canadian expatriates. The hurricane’s projected track also included Esquinapa, a town a few miles inland with almost 60,000 people in and around it. As of midday Monday, Willa was centered about 135 miles south-southwest of Cabo Corrientes and was moving at 7 mph. Hurricane-force winds extended 30 miles (45 kilometers) from the storm’s center, and tropical storm-force winds were up to 105 miles out. The National Hurricane Center warned that Willa could bring 6 to 12 inches of rain — with up to 18 inches (45 centimeters) in some places — to parts of Jalisco, Nayarit and Sinaloa states, with flash flooding and landslides possible in mountainous areas. Hurricane Willa is now a category 5 storm packing 160mph winds. #Willa is expected to weaken somewhat before making landfall Tuesday between Puerto Vallarta and Mazatlan.